Way back in May we bought tickets for a concert in October. The date on the tickets is today, not tomorrow like we thought. 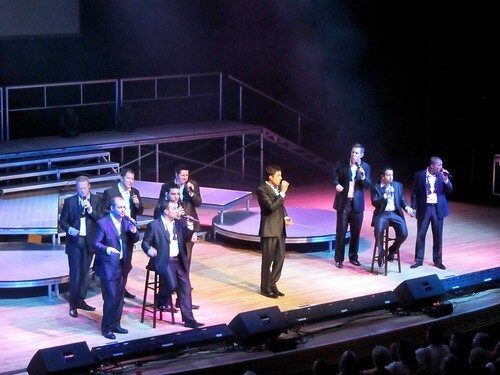 The entertainers...Straight No Chaser, aka SNC. This is our (Mickey, Meg, & I) fifth time seeing them and/or the IU group. They were fantastic as always. The time at the concert just flew by. I could have watched them perform for a few more hours. In the picture they are singing I'm Yours. They sang a lot of good stuff. They did Elvis songs (I'm not a huge fan of his but they made it cool), Michael Buble's Just Haven't Met You Yet, and my all time fave Coldplay's Fix You. So glad they have a new, but small, album coming out the end of next month. Can't wait to see them again....some day. We got home just in time to watch the end of the world series. Go Cardinals! I wish I would have gotten a shirt when we were in St. Louis earlier this year. Whoa...they did a nice job on those songs! I like them! I can see how you'd do it five times, for sure.